Remember when I wrote this post? The one where I lovingly and explicitly detailed five things that I swore up and down I would do different with baby number two? Let's just take a little gander back at that post and check our progress, shall we? Let's just get it out in the open now that this was, by far, the worst Progress Report that I've ever received in my entire life. Never say never, right? Maclane stayed with me every single night while I was in the hospital. Except for that one night with an incompetent young nurse who kept him in the nursery for over four hours because she "kept forgetting" to run his STAT bilirubin labs and report back to the doctor. I should get an A+ for how I handled that situation. There's just something within me that immediately takes over after my babies are born. I just cannot be away from them during those first few months weeks. Our breastfeeding journey this time around is so, so very different from my first adventure with Carter. With Carter, I felt so much pressure to do this and do that and for the four months that our "adventure" lasted I don't think I enjoyed a single moment of it because at best all it felt like was a chore. I don't want to jinx myself here but Maclane has been a Champion nurser from the get go. So much so that I've been able to put away more than 500 ounces of frozen milk in six weeks and more importantly than that, I love the time I get to spend with him when we nurse. Lofty breastfeeding goals? Let's just say I have plans to make it a little further than last time. Putting Maclane to sleep in his crib at three months gets an "IP" for In Progress. Knowing myself, I should really just get it over with and put a big fat "F" on that line but I'm going to give myself a little more time seeing that he's only six weeks old. And sleeping in our bed. Yes, that's right. He hasn't even made it into the bedside bassinet yet. Yep, just go on and give me that "F."
As far as Baby-wearing goes, I should get a medal for this one. I have become a rockstar baby-wearer thanks to a kind Internet Friend who graciously sold me her Ergo carrier. No more struggling with the Moby or breaking my back with the Bjorn. I am a reformed baby-wearer and I absolutely love it! And last but certainly not least, interviewing babysitters. I know, I know. This is something that I really need to work on. Let it be known, of course, that if we didn't live so damn far away from my parents, we would have two wonderful babysitters on hand at any given moment. But since someone insisted on moving 200 miles away from them, I've done a less than stellar job at finding suitable replacements. Keep in mind, I also have ICan'tLeaveMyNewbornBaby Disease which makes this process just a bit more difficult. Let's reevaluate this in another, oh, five months, shall we? I hear the Ergo is great, I have the Bjorn and I hate it, I hardly ever use it. Maybe I should get the Ergo??? We live close to both of our parents and they are the only babysitters we have used I the last almost 2 years. I don't know if I could leave the, with a stranger, good luck with that. 500 OUNCES?!?!?!?! HOORAY FOR MILK! SO proud of you even if you've given yourself a bad grade! I think you're doing a great job! I hate to say it but...I told you so! He! I knew there was zero chance you would actual send him to the nursery every night you were in the hospital! Glad you soaked up those precious cuddles! Don't you hate the things you swear you won't do and then you do them anyways. Watch out for the co-sleeping...I have a 2.5 year old that will NOT get out of my bed. It might be a little of me not wanting him out yet, but still he won't leave. LOL! On the babysitter thing...Have any friends with a daughter home from college that needs to make some extra money? Get some referrals from friends. Sometimes our plans are one-upped. You're doing great just the way things are, mama! I love the Ergo! It was a lifesaver when Landon was little! Sticking to plans is for the birds, yeah? 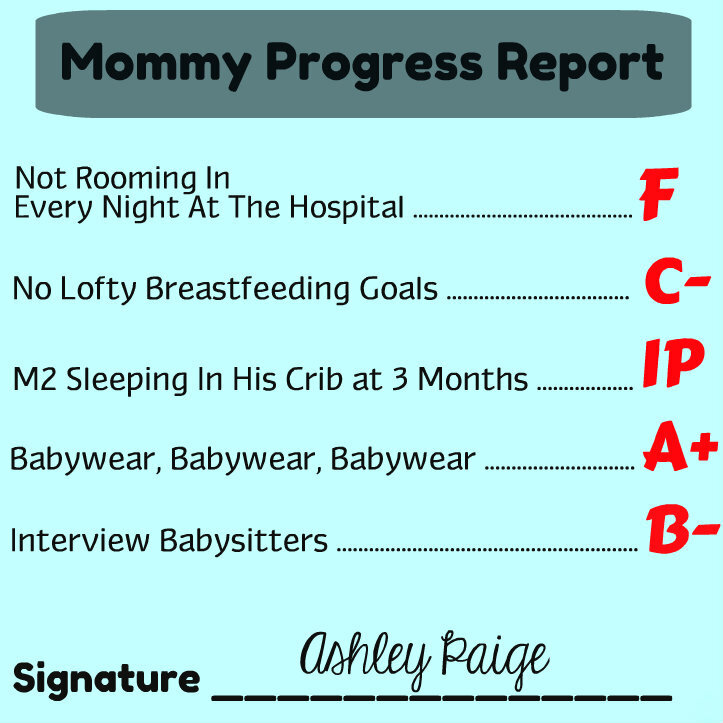 I'd say most moms wouldn't be jumping to share their progress reports for this very reason :) Progress report aside I'd say your juggling the life as mom of 2 pretty well. 500 ounces? Holy cow! Literally, you're like a one woman dairy bar over there! I hope my breastfeeding experience is better the next go around. You're doing awesome! Jamie didn't sleep in my hospital room once. And was in his crib, in his own room by the second night we were home. On one hand I feel like a rockstar since I would have aced that part of your report card. On the other, I am beginning to think I'm missing some motherhood gene for not wanting my baby attached to me all the time. I think you're adjusting great! As we all know motherhood is kind of a fly by the seat of your pants kinda job! Sticking to plans can be overrated! Getting through the tough stuff, noticing the successes and feeling good about them is more important. At least I think so! Wow your stockpile of milk is beyond impressive. I got mine up to 60 and have been struggling lately. I'm about to try all your tips though. WOW you've set some pretty hefty goals there, AP! I think you're doing just fine - so impressed with the milk production! Seriously - that's insane! It gets to be addictive when it starts piling up in the freezer, doesn't it? OK, you are doing an AMAZING job! 500 ounces saved? Milk bar? More like milk factory! And I've been wondering if Mac roomed with you at the hospital! Oh well, you did what felt right. Maybe that's what kickstarted your amazing BF journey! Keep up the good work - I'd give you all A's! Dude, I said the same thing about sending my baby to the nursery in the hospital--but even though I was alone without Declan? I wanted her with me. I didn't let her leave my side. That TOTALLY surprised me. Because before I was all, TAKE MY BABY!